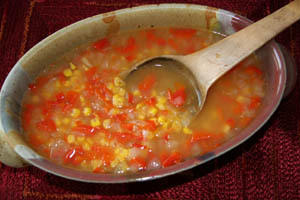 Corn soup can be made in a variety of ways. One of the most popular methods is to use cream and/or milk, but this recipe does not include any. Black pepper and salt to taste. The type of stock you use will determine the saltiness of the dish. Heat 2 T vegetable oil (or 3 T of vegetable stock) to medium heat in frying pan. When hot, add onion, pepper, and corn and sauté about 6-8 minutes or until tender. You can add additional sliced peppers on top as garnish for a pretty presentation.